The equipment is placed on the field as indicated in image number 1. The players are positioned on the field as indicated in image number 2. When the instructor blows the whistle, the referee and the assistant referee begin to perform the exercise as indicated in the numerical sequence. The referee finishes by heading towards the free kick area. The referee manages the position of the wall and orders the restart of play. The free kick is taken with the aim of hitting the wall or enabling a defender to handle the ball. Once the action is finished, the referee and the assistant referee cool down for the indicated time and perform the same exercise in the opposite direction. The work with the assistant referees is carried out on both sides of the field and starts simultaneously, but only the assistant referee concerned takes part in the technical decisions. The referee starts the exercise from cone nº 1 with a forward run (10 m) to cone nº 2, followed by a rightwards side run (5 m) to cone nº 3. He continues with a leftwards side run (5 m) to cone nº 4, followed by a forward run (5 m) to cone nº 5, and a backwards run (5 m) to cone nº 6. 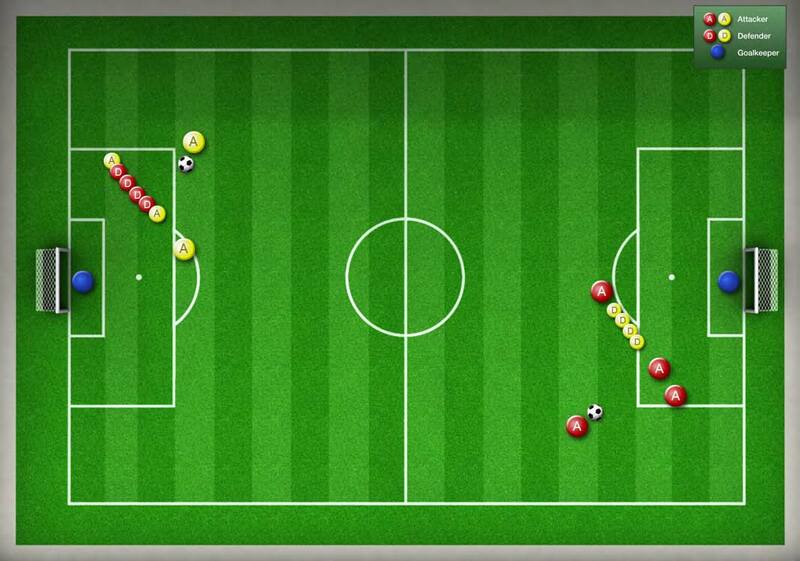 He finishes with a forward run, passing between the two cones on the halfway line towards the decision-making area. The referee manages the taking of a free kick close to the penalty area. Where appropriate, he penalizes the fouls or infringements committed. The referee, once he has taken up his position, positions himself with his back to the wall and blows the whistle to signal the taking of the foul. Then, he turns around and does an immediate visual search to regain control of the situation. 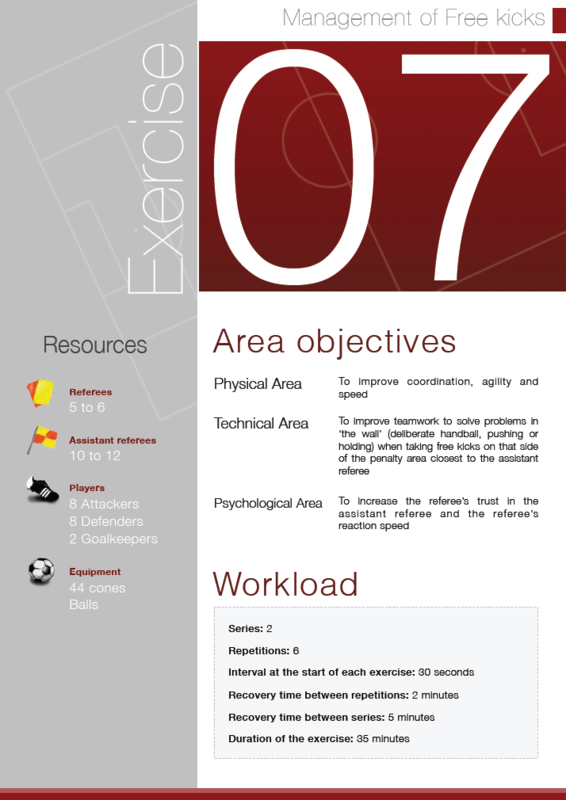 The assistant referee starts the exercise from cone # 1 (5m from the halfway line) with a side run (3 m) to cone # 2, followed by a side run (3 m) to cone # 3, a forward run (5 m) to cone # 5 and a backwards run (5 m) to cone # 7. He finishes with a forward run to the decision-making area. The assistant referee helps to identify fouls or infringements committed outside the view of the referee. The assistant referee informs the referee of any incident occurring behind the referee’s back, as well as in his own working area after the ball is kicked. The defending players form a wall. Two attackers position themselves on either side or in front of the wall. The player taking the free kick attempts to get the ball just over the wall to enable one of the players to either deliberately handle the ball or make it hit his hand/arm. The players forming the wall can also commit pushing/holding offences. The players take the free kick immediately after the sound of the referee’s whistle. The instructor blows the whistle at 30 second intervals, coordinates the groups taking part in the exercise and controls the execution of the exercise technique. The instructor finds a position on the field from where he can explain the action to the players and check the work carried out by the referee and the assistant referee. He evaluates the decision taken and makes the relevant observations. The instructor checks and reinforces the teams’ work and confidence.